This is a 1901 Decatur Herald and Review Photo of a Wabash train that probably passed through Illiopolis. Governor Joseph Duncan, in 1834, succeeded in forcing approval of a steam engine railroad to be built between Quincy, on the Mississippi River, via Clayton, Mt. Sterling, Meredosia, Jacksonville, Springfield, and Decatur to Danville and the Illinois-Indiana State Line and the new railroad was to be built with State funds. This new railroad was known as the "Northern Cross," a name chosen according to some historians, because of the line surveyed for the railroad closely paralleled a well-known trail known as the "Northern Crossing" of Illinois and often called "Northern Cross" although it was actually in the south central part of the state. It was the only segment of the ambitious Internal Improve­ment Act to become a reality. In 1842 a line between Jacksonville and Springfield was completed, and in May 1842, service from Meredosia to Springfield was made available. The drama of the building of the Northern Cross Railroad is the first chapter in the romantic story that is the growth of the Wabash Railway system, for the lineage of the Wabash can be traced, without a break, to the first 12-mile strip over which the engineer Fields operated a clumsy little locomotive between Meredosia and Morgan City in the fall of 1838. The year 1847 saw the first change in the new sys­tem that was soon to become known as the Wabash. The legislature of the State of Illinois authorized the sale of the original track between Meredosia and Springfield. Nicholas H. Ridgeley was the purchaser. He paid the sum of $21,000 for the road, changing its name to the Sanga­mon and Morgan Railroad. Ridgeley's purchases turned out well, for at the time the extension of the road from Springfield-to the Illinois Indiana State line had been temporarily abandoned by the state because of lack of fund, and a short time after his original buy, he was granted an extension of his charter, to include the entire length of the Northern Cross. Together with his new partners, Nicholas Ridgeley pushed the rehabilitation of the line between Springfield and the Illinois-Indiana state line. Already railroad traffic was mounting in the East, and plans were underway for rapid extension of the Eastern roads to top the rapid developing states of Illinois and Missouri. 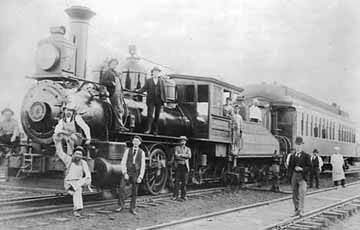 Subsequently, on February 12, 1853, the name was changed to the Great Western Railroad of Illinois and trains started operating into Decatur on May 9, 1854. In the spring of 1855 the Sangamon River was bridged and the road completed eastward, the first train arriving at Danville, Illinois, in November 1856. The Great Western Railway of Illinois was to connect at the Illinois-Indiana line with a line westward from Toledo across Indiana to the border. However, progress was slow and in 1857 another series of "trades" changed the membership of the trackage that is now known as the Wabash. During its entire period of expansion east of the Mississippi River, the Wabash system served as the principal artery tapping the great "Heart of America." Other rail, roads entered the Illinois-Indiana Territory, but these rail, roads moved only toward the most important cities and the vast, undeveloped regions which today are the most productive sections of the great "Heart" were accessible only over the tracks of the Wabash. In 1879 the Wabash Railroad Company operating east of the Mississippi and the St. Louis, Kansas City and Northern, operating west of the Mississippi were merged into the Wabash, St. Louis and Pacific Railroad Company. In 1889, both lines east and west of the Mississippi were again reorganized, this time as the Wabash Railroad Company. Now 100% dieselized for both passenger and freight service, and upholding its promise of ever better service to the Heart of America, the Wabash again stands on the threshold of a bright, successful future. Quoted from an historical account compiled by Mr. Clyde M. Betts, ticket clerk in the Wabash passenger station, Decatur, Illinois.